Luck has never been a friend of mine. Anything left to chance will fail. You do not win or lose a gamble, you lose the moment you take the gamble. Plan, calculate and plan again. No one but the Emperor got your back. The unofficial recognized nickname of the 7th company is somewhat a inside joke of the 501st. While the rest of the army is usually deployed in cohesion, be it at home training or when being called upon to take part in the never ending grind, the 7th company are the unlucky ones being sent away on separate minor, often less glorious assignments requiring only minor manpower. Hence the name “Foreign Legion”. The assignments in question tend to either end up being incredibly long, boring and uneventful, or a complete loss of the company. Often with no details of what happened. This is why the company operate with a timeout protocol. If they miss their scheduled check dates for a set number of times, the company will be assumed lost and a new 7th drafted from the other companies of the 501st. With assignments rating from bad to terrible, manny a officer pass on the chance of leading the 7th if they have the chance to say no. This is why the responsibility often falls upon younger officers with little choice but accepting. 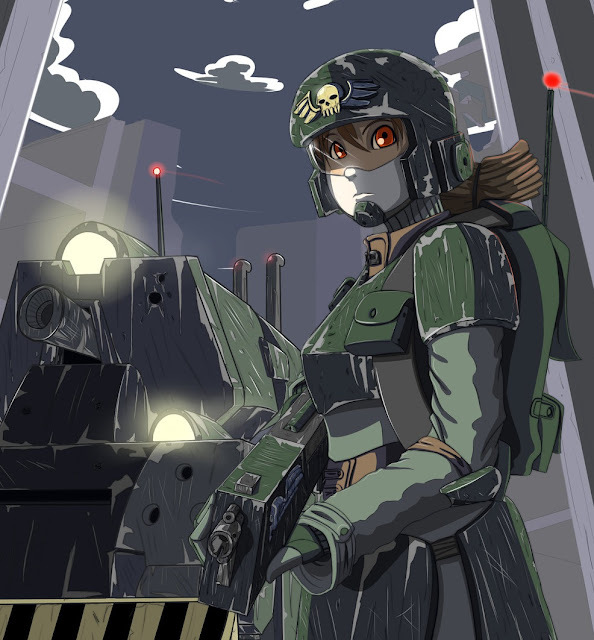 As is the case of Emilia Faust, commander of the 7th company at the current time. Losing both her parents only months after birth to unexplainable events, Emilia grew up being told her family carries a curse. Haunted by bad luck her entire career (accounting for her entire life, being a army orphant), Emilia have been bypassed by younger, less experienced officers times and times again. The time finally came where the brass would look bad for holding her back, so with great reluctance, the officer of bad luck finally got promoted to her first company command… and sent as far away from the main force as possible within the strict assignment regulations of the Militarum. Sitting amid a nebula of various gasses, the planet Nolan XVII suffer decay quickly to anything not routinely maintained. The once great infrastructure network of highways, train lines and conveyor belts now lie in rusty ruins, bits and pieces, next to non-existing. The remaining population live in communities somewhat isolated from one another, relying on airborne and off-planet means for communication. But as it is with isolated communities, lack of contact and control easily end up out of hand. The population on the planet generally suffers a higher unrest ratio than most imperial worlds, and uprisings are common. With the PDF lacking the means of keeping things under control, the system sent a plea to the Militarum for help. So was it the “Foreign Legion” ended up being deployed to the decommissioned forgeworld of Nolan XVII. In a joint effort with the mixed-aircraft 1305th tactical wing, the responsibility of the task force is twofold: To launch airborne assaults on revolting settlements and garrison strategic sites across the planet. With the absence of ground infrastructure, the wilderness have reclaimed the lands in between the scattered settlements. The task force therefore rely heavily on airborne troops and air superiority to fulfil its duty rather than lumbering tanks and vehicles. Recently, for no apparent reason given, the task force was transferred under inquisitorial control. Strangely, no order was given to move off planet nor change of objectives. Could it be that something triggering the inquisitions interest is happening or about to happen in this very system? Tomorrow is going to be a routine day. The force is to engage a group of unidentified targets crossing a restricted area north-east of the generatorum. Probably just another group of looters.